Art overpasses the world of representations, and exposes the truth of the hidden life. The Artist’s job is the progress of expressing instead of the outcome of it. A stranger, who is wandering outside the world of value, his practice of solitary exposes the hidden meaning and value of these representations. Facing up to nothingness can lead to the discovery of another existence. 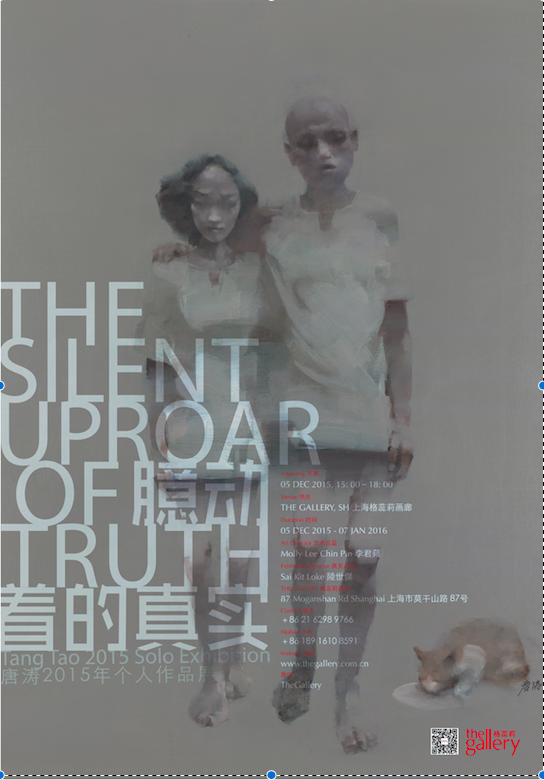 Tang Tao’s art is powerful, showing the real nothingness which is covered by the world of representations, in which the blurred ordinary figures are shining in the blank space which is detached from the realistic context. In the elusive, grey area which is stretching impulsively, flows the concerto of emotions echoing the perceptions of life. Tang Tao masters both depicting details and handling the whole picture’s vigor. His neat, dynamic strokes grasp the fleeting specific facial expressions and gestures, shaping a free existence. In his work, the bright silver color is mottled by ochre and gold colors which are slightly sparkling, and the elegant, static figure unconsciously reveals the ridicule of the mundane life. The whole picture is shining with humanity in the solemn atmosphere. He concerns about ordinary people and expresses them in his works, during which he tastes the flavor of life and manifests his calm, self-sufficiency internal world.